FILE - Japanese Prime Minister Shinzo Abe, left, and Chinese President Xi Jinping approach each other for a handshake before a group photo session for the G-20 Summit in Hangzhou, in eastern China's Zhejiang province, Sept. 4, 2016. The two will meet Thursday, when Abe starts a three-day visit to China. The U.S.-China trade war is helping push Beijing and Tokyo closer. How close will become clearer later this week, when Japanese Prime Minister Shinzo Abe makes his first visit to China since taking office in 2012. Analysts say the three-day trip is unlikely to resolve historic territorial disputes between the two sides, but it will provide Abe and Chinese President Xi Jinping a rare opportunity to warm ties and try to advance key policy agendas. Abe arrives Thursday in Beijing accompanied by an entourage of more than 500 business leaders who, with their Chinese counterparts, will attend an investment forum focusing on collaboration in third countries. As relations between Beijing and Washington worsen, China is looking to build closer ties with Abe, a leader who has visited the United States frequently and has sought to build a friendly relationship with U.S. President Donald Trump. In recent weeks, a handful of countries have canceled or scaled back billions of dollars in belt and road projects over concerns about debt. 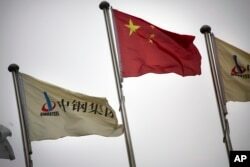 China denies it is trying to create debt traps and take advantage of developing countries. FILE - SinoSteel Corp. and Chinese flags fly outside of the company's headquarters in Beijing, China, Nov. 18, 2015. "There is a stiff competition between China and Japan vying for deals in third countries," an experts says of competing economic ambitions between the two. Japan’s participation in projects with China could help ease those fears. During Abe’s visit, dozens of investment announcements are expected and some are looking to see whether the two will collaborate in places such as Thailand. "There is a stiff competition between China and Japan vying for deals in third countries and competition adds to both countries costs,” said Jiang Yuechun, a senior research fellow at the China Institute of International Studies. “If both countries can find a way to cooperate or complement each other's strengths that could create a win-win situation for both countries and further benefits for third countries as well." Japan has made clear it supports the idea of building infrastructure to help boost economies around the globe, but it also has stressed that investments it participates in be transparent, economically viable and fiscally sustainable for the host country. When Trump visited China last November, the two announced $250 billion in trade deals. Trump is entangled in trade disputes with both Japan and China and criticized the two countries trade practices and deficits with the United States. Jiang said the two leaders are likely to use the meeting to voice their similar concerns about trade and tariffs. “But I don't think China will ally with Japan to stand against the U.S. That is unlikely given the U.S. and Japan have a strategic alliance,” he said. 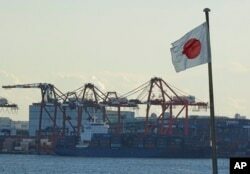 FILE - A Japanese flag is hoisted near the pier of a container terminal in Tokyo, Jan. 25, 2017. China is Japan’s biggest trading partner and more than 30,000 Japanese companies have operations in the country. As far as trade disputes go, Japan is in a better position than Beijing. Late last month, Tokyo and Washington agreed to shelve auto tariffs and begin negotiations on a free trade agreement. China and the United States remain deeply divided. At the same time, however, China has been working hard to push a free trade agreement of its own for the region, the Regional Comprehensive Economic Partnership, and is likely to use the meeting to buoy support for that agreement and the goal to finish the deal by the end of this year. A Japanese government source said that reaching an agreement is desirable, “but at the same time we can’t compromise too much on standards.” He also added that there are differing views among participants of RCEP as well, which includes six Asian countries and members of the Association of Southeast Asian Nations. China is Japan’s biggest trading partner and more than 30,000 Japanese companies have operations in the country. Last year, Japanese investments grew for the first time since 2012 when a territorial dispute over uninhabited islands in the East China Sea and frictions sent relations into a nosedive. Ties were so tense there were concerns the two countries might enter into a military conflict, which contributed to an exodus of Japanese businesses. That dispute remains unresolved, but Japanese investment is picking up again, growing by 5.1 percent last year. Abe's visit comes as the two countries mark the 40th anniversary of the signing of the Sino-Japanese Peace and Friendship Treaty, and with that, both are looking to open a new page in relations.